I'm missing a schedule for the oversea invitation tournaments. I also hope that for a win you receive a travel voucher, otherwise this is quite bad ev for everyone not living in Tokyo/ Japan. Just 300k Yen for fighting through a mass of previous champions and hall of famers? The money is not even incentive enough for a lot of qualified people to play in. Otherwise this a cool idea and I'm sure everyone would love to participate. I would definitely go, if flight was included in the invitation. I'm signed up and I think I'll be going - can't exactly make definate arrangements before january, but will ASAP book flight & hotel. Would be cool if some of you could make the trip! Sadly it's exactly the day my father is turning 60... but GL to all who go there. are there any more details about the prizes here? 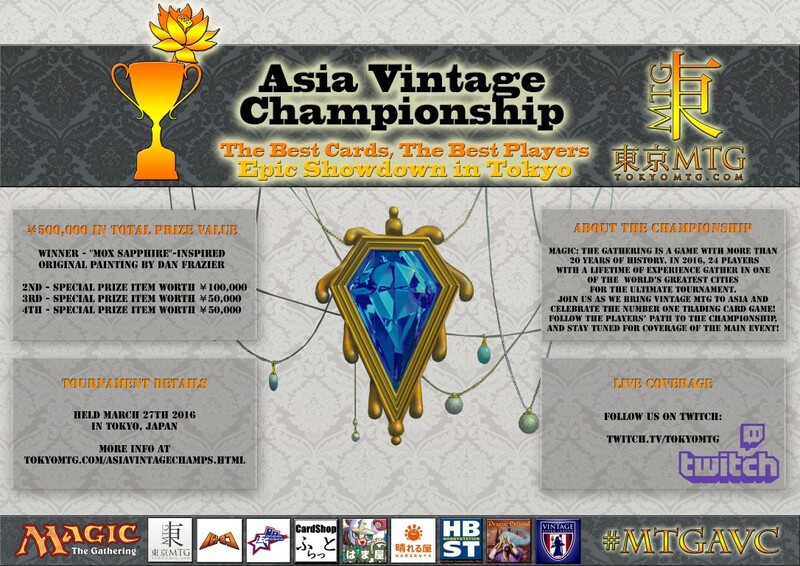 If you want to be invited to Asia Vintage Championship, play the Friday Vintage tournament at Prague Eternal 11th of March. If you win, you will get 500 EUR for the flight ticket + some other price. Twiedel - will you come?